… data and analytical tools to examine Metro GDP patterns and trends. As a policy-maker, investor, business, advisor or stakeholder, it is important to know how and where the metro economy is changing … and how one or selected metros relate to the U.S. and other metros. Is metro X changing in a different direction than metro Y? By how much, why and is there a pattern? What does the healthcare sector, for example, contribute to a metro’s gross domestic product (GDP)? How does it compare to peer metros? How is the healthcare industry trending? Metro GDP data can provide insights and answers to these important questions. Developing insights using metro GDP data — an example. See related Web section for more detail. The following graphic shows patterns of change in per capita real GDP by metro from 2010 to 2015. The orange and red fill patterns show metros experiencing a decrease in per capita real GDP over the period. Click graphic for larger view that shows the 2015 rank of the metro among all 382 MSAs based on 2015 per capita real GDP. 282 metropolitan statistical areas, of the total 382, experienced an increase in real Gross Domestic Product (GDP) between 2010 and 2015. Growth was led by growth in professional and business services; wholesale and retail trade; and finance, insurance, real estate, rental and leasing, Collectively, real GDP for U. S. metropolitan areas increased 2.5 percent in 2015 after increasing 2.3 percent in 2014. Use the interactive table and GIS project/datasets described in this section to view/analyze patterns and characteristics in metros of interest. Real GDP by sector profiles are available for the U.S. and each state and MSA. The Metro GDP data are part of the State & Regional Income & Product Accounts (SRIPA). The following profiles illustrate these data for metros, states and the U.S.
View Metro GDP Characteristics section in the Metropolitan Area Situation & Outlook Reports, providing the same scope of data as in the table below integrated with other data. See example for the Dallas, TX MSA. GDP tells an important but small part of the broader metro demographic-economic characteristics. Most metros have sub-county areas experiencing growth or activity sometimes masked when looking at the entire metro. Click a metro (metro GDP estimated for MSAs only) link in the table at upper right to view the GDP estimate in context of related subject matter. The following graphic shows an illustrative view of the interactive MetroGDP table. This view shows California MSAs ranked in descending order on percent change in per capita real GDP from 2010 to 2015 (ranked on far right column). Use the table to examine characteristics of metros in regions of interest. Click graphic for larger view. .. data and tools to examine the purchasing power of the incomes in different metros and states … this section reviews how you can access to data on what $100 buys by state and metro. Examine patterns of what $100 buys by year, 2008-2014, for all items and by type of goods & services category. Use the interactive table to view, rank, compare the Buying Power Index for each/all states and metros (MSAs). See the main Web page for more details. The following graphic shows patterns of 2014 all items buying power of $100 by metro (MSAs). The color patterns/intervals are shown in the inset legend. Click graphic for larger view. Expand browser to full window for best quality view. 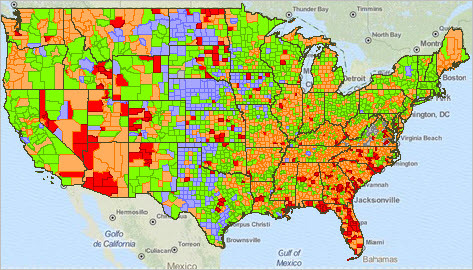 Use GIS tools to develop thematic pattern maps for a range of data and criteria. 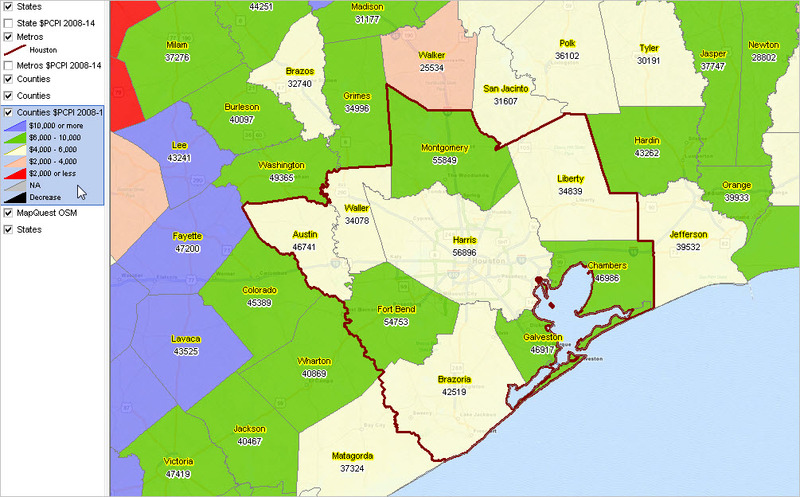 Varying prices by region can be normalized using Regional Price Parities (RPP). The RPP is a weighted average of the price level of goods and services for the average consumer in one geographic region compared to all other regions in the U.S. See more about RPP measures. Using the RPP data, what $100 will buy can be determined by state and metro for the categories of all goods and services, goods, services-rents and other services. See about RPP goods and services types. In the Boston metro, $100 buys about 90.7 percent of all items goods and services due to the high prices there. $100 in Boston seems more like $90.70 compared to the national average. In the Jefferson City, MO metro, the opposite is true. $100 buys all items goods and services due to lower prices in that metro. $100 in the Jefferson City, MO metro is the equivalent of $121.65 of all items goods and services compared to the national price levels. The following graphic illustrates use of the Buying Power Index interactive table. This graphic shows the 10 metros that have the all items highest Buying Power Index. Use the interactive table to view/examine areas of interest. .. how does the real purchasing power in metros of interest compare to other metros? Use data and tools reviewed here to examine the purchasing power of the incomes in different metros and states … this section provides access to regional price parities (RPPs) estimates developed compare regions within the U.S. RPPs are regional price levels expressed as a percentage of the overall national price level for a given year. The price level is determined by the average prices paid by consumers for the mix of goods and services consumed in each region. See about these data. See example about using RPPs below in this section. .. for all states and metropolitan statistical areas (MSAs). • Use GIS tools described here to develop RPP thematic pattern maps. .. add your own data & geography, select different HPI measures or criteria. .. zoom to different geographic extents, label and modify colors as desired. The following graphic shows patterns of 2014 all items Regional Price Parities by metro (MSAs). The color patterns/intervals are shown in the inset legend. In additional views (below this graphic) metros are labeled with the 2014 all items RPP. Click graphic for larger view. Expand browser to full window for best quality view. Use the GIS tools described here to develop thematic pattern maps for a range of data and criteria. — Houston, TX metro compared to Waco, TX metro. The the all items RPP for the Houston metro in 2014 was 100.3 while the all items RPP for the Waco, TX metro in 2014 was 91.5. (from RPP table). On average, prices are 0.3 percent higher and 8.5 percent lower than the U.S. average for the Houston metro and the Waco metro, respectively. 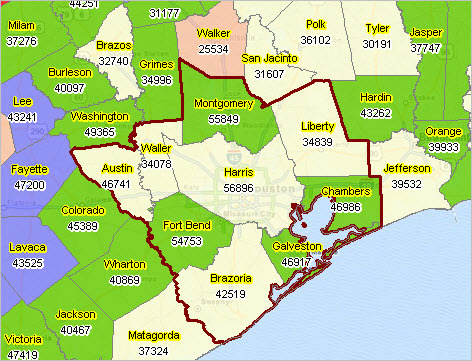 The per capita personal income (PCPI) for the Houston metro in 2014 was $54,820 and the per capita personal income for the Waco metro was $35,340 (get from the table at http://proximityone.com/reis.htm). The RPP-adjusted PCPI values are $53,223 ($54,820/1.03) and $38,622 ($35,340/0.915), respectively. The gap between the purchasing power of the two metro PCPIs is reduced when adjusted by their respective RPPs. — Washington, DC metro compared to Columbia, MO metro. • The RPP-adjusted PCPI values are $52,742 ($62,975/1.194) and $44,535 ($41,418/0.93), respectively. Use the interactive table to examine the RPP by state and metro. The following graphic illustrates use of the table to show the 10 metros having the highest 2014 all items RPP. Click graphic for larger view. Examine metros and states of interest with more detail using tools below the table.